Phew, what a week! Sorry for the lack of posts lately but I only have 2×1 hours daily where I am able to sit down and concentrate on blogging. My son Noah needs heaps of attention at the moment and wouldn’t let me work when he’s awake. Unfortunately the household, the cooking etc needs to be done as well and so there’s not much time left to write new blog posts. It has been a gorgeous week here in Sydney. After a few rainy days last week it feels amazing to finally get back some sunshine and spend time at the beach with the little one. On Monday I decided that it was time to do a 3-day detox diet (which I failed after day 2…) as we had way too much (unhealthy) food during last week. It’s like we went on a trip to Italy because we only ate lasagne, spaghetti, dumplings and heaps of chocolate and ice cream….oooops. Well, I guess sometimes a breastfeeding mummy just needs that! Anyway, somehow I managed to have a few healthy breakfasts and salads in between our feasts. 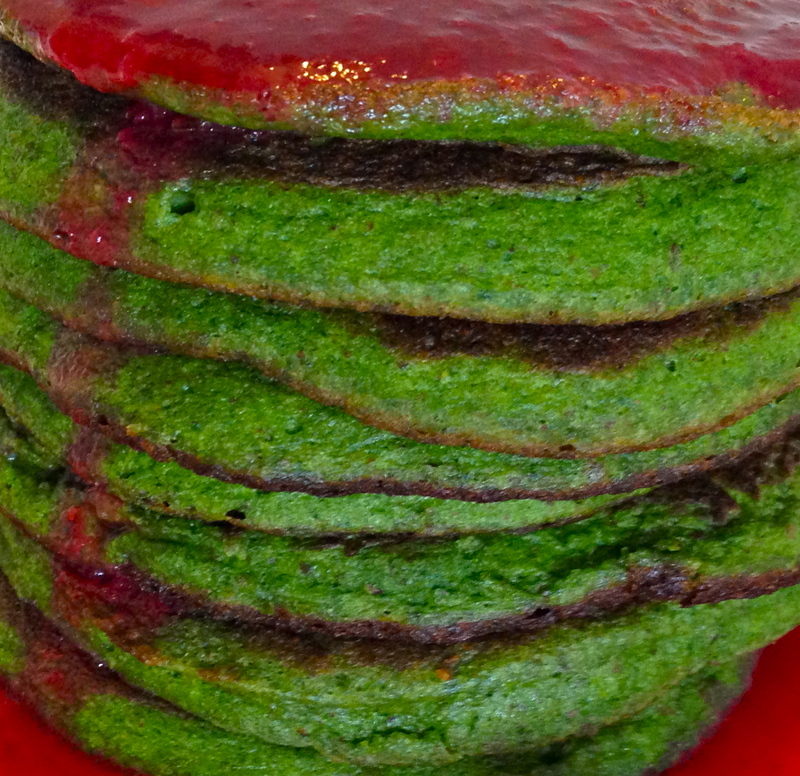 I tried to make green pancakes for the first time and hey, they turned out really delicious. Now, I understand, that some of you (including my husband) might be a bit scared of something that’s green but trust me, these are so so good, you won’t be disappointed. Combine all dry ingredients into a bowl and stir to mix. 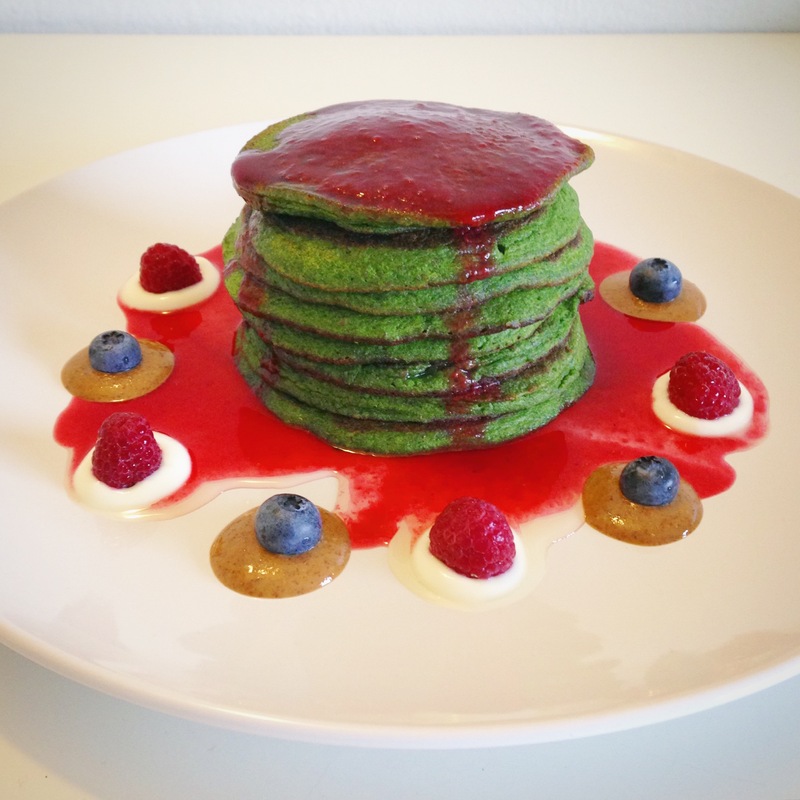 Place spinach, eggs, banana and vanilla into a blender and blend until smooth. Add wet ingredients to dry ingredients and stir until flour is incorporated. Heat oil in a large frypan over medium heat. Drop a tablespoon of batter into pan. Repeat to make about 8 mini pancakes. Cook for 2 minutes or until bubbles start to form on surface. Turn over. Cook for 1 minute or until golden and cooked through. 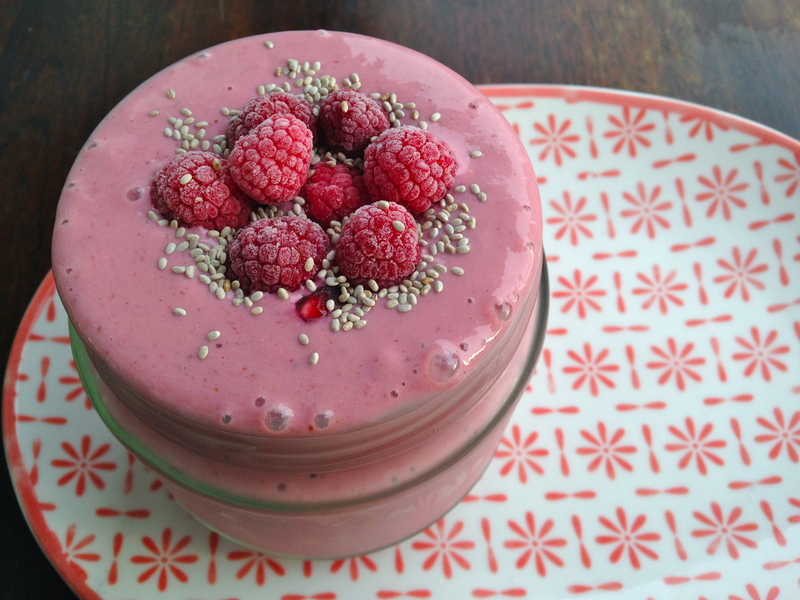 I served it with homemade almond butter, greek yoghurt and berries. Kale is such a delight. Before we moved to Sydney I had never heard of Kale before. I’m pretty sure you couldn’t get it in Austria two years ago, or at least I have never seen it in a shop before. Maybe it made it’s way there by now, but I got introduced to it here in Australia. I mean, of course we do have some sort of cabbage in Austria but just not the curly leaved one kale you can find here. In Sydney you get it everywhere. They sell it in form of salads, chips, soups, smoothies, juices, sautéed as a side dish and so on. 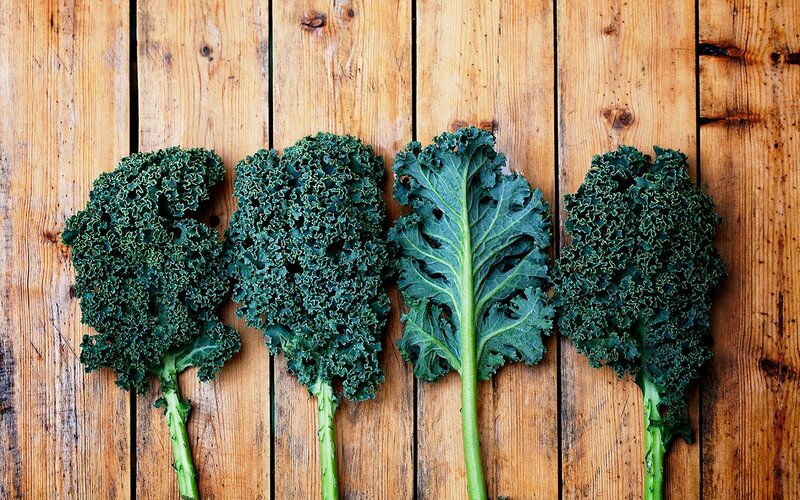 So, what exactly is this trendy super food everyone loves at the moment? 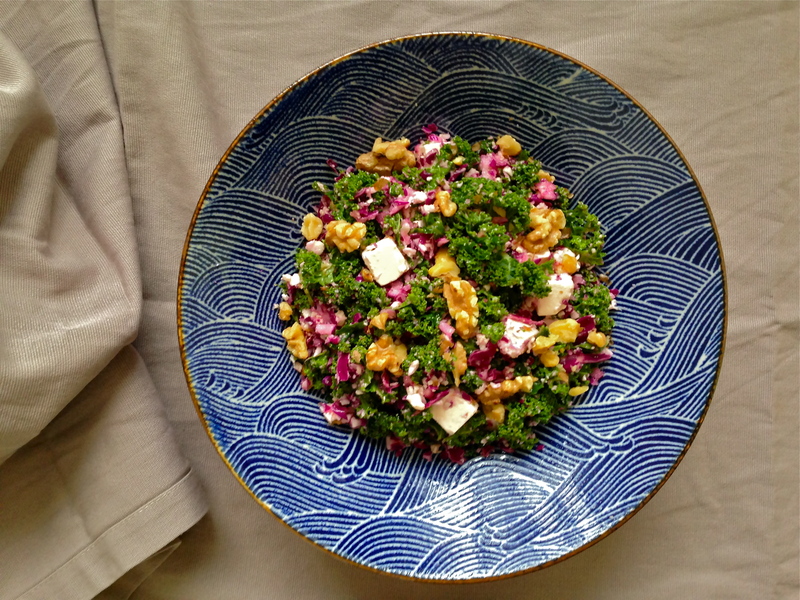 So we know now that kale dishes are packed with nutrients and fiber – no wonder I feel like Wonder Woman after I eat a giant bowl of kale salad. 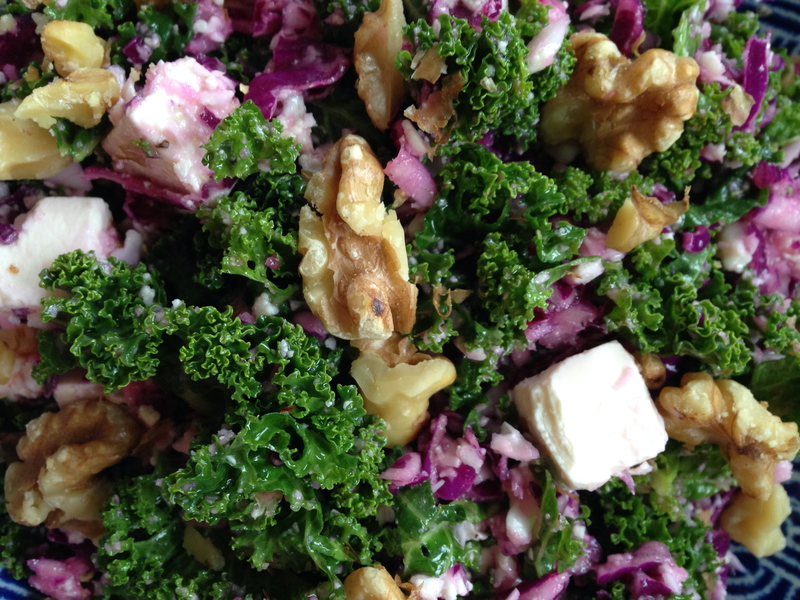 Here’s just one of many ways to eat kale. Place the cauliflower into a food processor (or blender) and process until it has the consistency of couscous. Tear small pieces off the kale stems, discarding the stems and placing the leaves into a bowl. Add the cauliflower “couscous” and the sliced cabbage to the bowl and crumble the feta cheese on top. Drizzle the lemon juice and olive oil onto the salad, add salt and pepper and top with the toasted walnuts. So, I had half a pomegranate sitting in my fridge for quite a while and yesterday morning I decided it was about time to do something about it. Sound good? 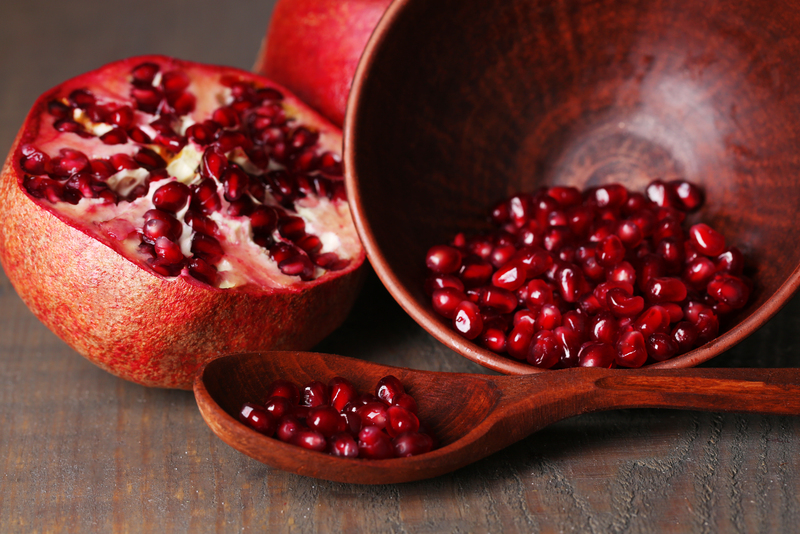 Well, then go and buy some pomegranates and give this powerful pink smoothie a go! Simply place all the ingredients into a blender and blend until smooth. If you like it a little runnier add some water. Noah, my 13 month old son, used to be quite a good eater but a few weeks ago he decided to become very difficult when it comes to eating lunch and dinner. Breakfast is fine, he always seems very happy about feeding himself and is very impatient if my preparation takes too long (don’t ask me why…he still gets a bottle at 11 pm, the so called “dream-feed”, and I breastfeed him as soon as he wakes up in the morning…so he shouldn’t be hungry at all). I have no idea why he is such a fussy eater at the moment and it really upsets me that so much lovingly prepared food ends up in the bin. Anyway, I’m not giving up on him being a better eater and I just keep on doing what I’m doing. I hope it’s just a phase…. 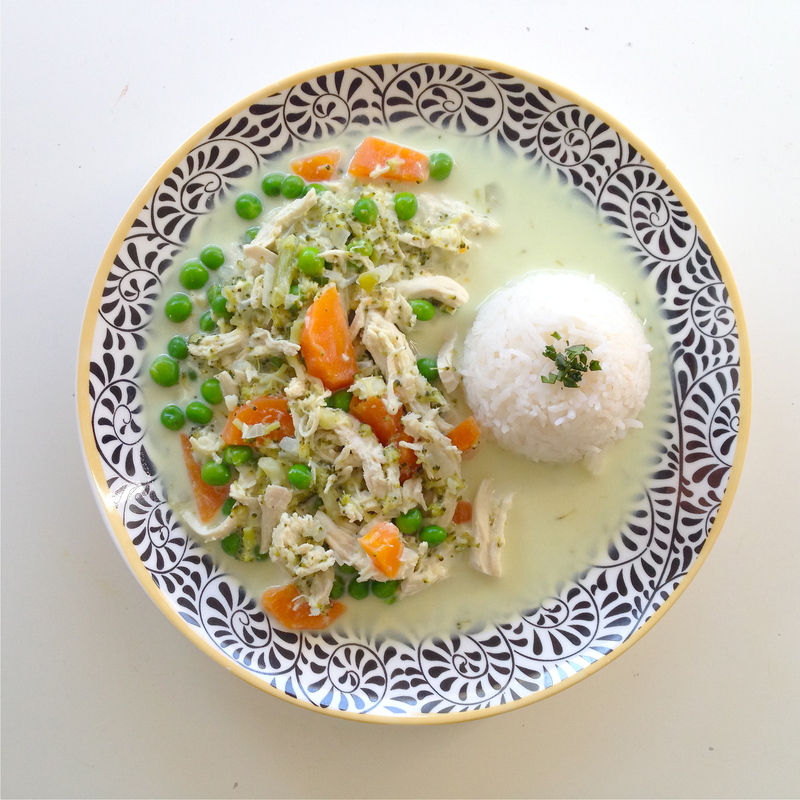 This chicken coconut curry I cooked yesterday was quite successful. I think adding peas was the winner. He loves peas. Actually he loves everything that is round, little and colourful. His favourite fruits are blueberries. If you put a bowl of different fruits in front of him, he would always go for blueberries first and not until there’s no more of them left will he then go for other fruits. He didn’t eat the whole plate but I managed to feed him more than half of it while he was enjoying picking out every single pea with his chubby little fingers. Start by heating the oil in a large sauce pan. Add onion and garlic and cook until soft or lightly golden. Add the chicken, curry powder, carrot, water and coconut cream and bring to the boil. Then reduce heat and let cook for about 10 minutes. Add the broccoli and cook for another few minutes until broccoli is tender. Add peas and coriander just 2-3 minutes before serving. For me, as a European, it’s really weird to have winter in summer. I mean, May, June, July, August used to be my favourite months of the year as they were warm, sunny and full of happy times at the lakes, or trips to exciting new places by the sea. Now, that I live in Australia, it’s the opposite. We have winter now. Not that I would call it that…it’s more like autumn in Austria. All the frangipani trees have lost their leaves or are still loosing them, and the beach is almost empty, except for a bunch of surfers who don’t mind the cold outside – the water is still nice as my hubby would say… When I say cold I mean around 10-20°C…that’s what the Aussies call winter. There is no snow or foggy days, no, there is sunshine, lot’s of sunshine and sometimes a few rainy days and wind. The problem is that as soon as the sun goes down it gets cold and the nights, I tell you, they can be a bit chilly. The houses are not built for this time of the year–don’t ask me why…I have no idea! They don’t have central heating like almost all of the houses in Europe have and their windows are thin…omg they are really thin. Anyway, it’s beautiful here and it’s nice that Bondi Beach is empty and quiet for a few months of the year. Now, I looove to eat salad, nothing better than a fresh & healthy bowl full of vitamins and nutrients on a warm sunny day. But what if it’s cold and rainy and you feel more like a warm, filling dish but still craving the sourness and freshness of a salad? 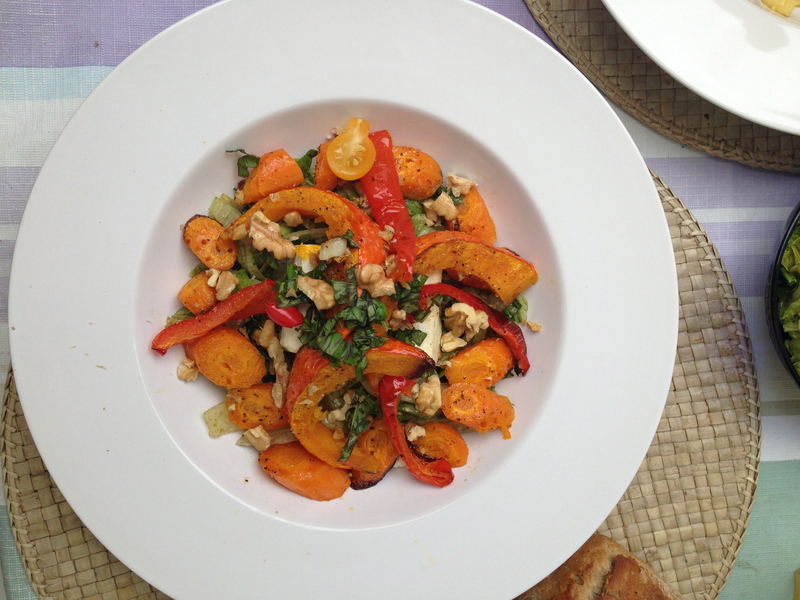 That’s when my warm pumpkin salad is the perfect choice for you! Meanwhile heat a little olive oil in a frying pan, add the pumpkin seeds, walnuts and garlic and cook until golden. Transfer the roasted veggies, tomatoes and feta cheese to a bowl, add the lemon juice, a bit of olive oil, and salt and pepper and mix thoroughly until well combined. 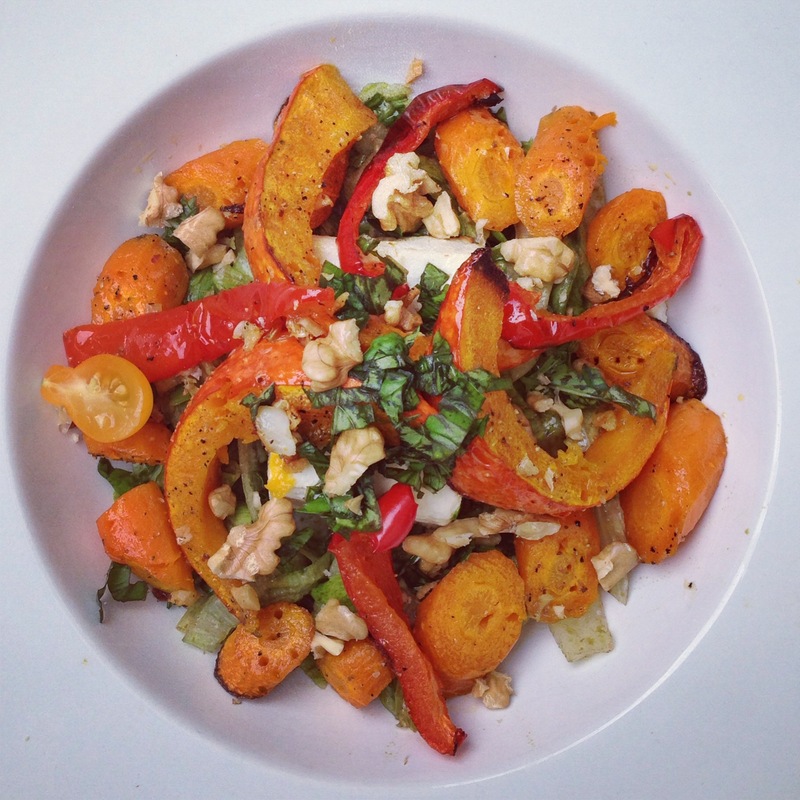 Serve with the roasted nuts and seeds on top. Winter’s here! Yesterday was really wet and cold in Sydney, so I thought it would be nice to have a warming hot soup for dinner. I bought green split peas a few days ago and our fridge was full of veggies so I decided to make a big pot of veggie split pea soup. Soups are not everyone’s favorite but I’m a big fan of soup. They are super easy and quick to make and they warm you from the inside out. Nothing better on a cold winter’s day….especially when you have a little toddler at home who needs your full attention and is a difficult eater at dinner time, it’s nice to not have to worry about the soup slowly cooking on the stove. 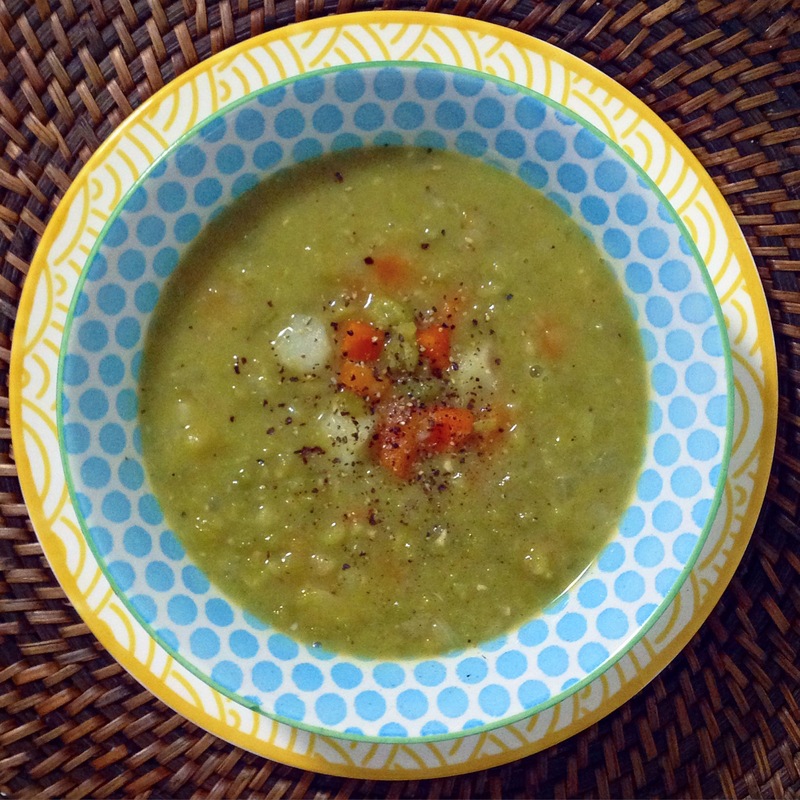 Although often made with a ham bone, my version of split pea soup is so hearty and heart healthy you won’t miss the meat. Serve with thick slices of rustic bread. Heat oil in a large pot over medium heat. Add onion and garlic and sauté until softened. Stir in vegetables and sauté for a few minutes. Then add peas, water, bay leaf, salt and pepper and bring to a boil, cover, and reduce heat so liquid is simmering. 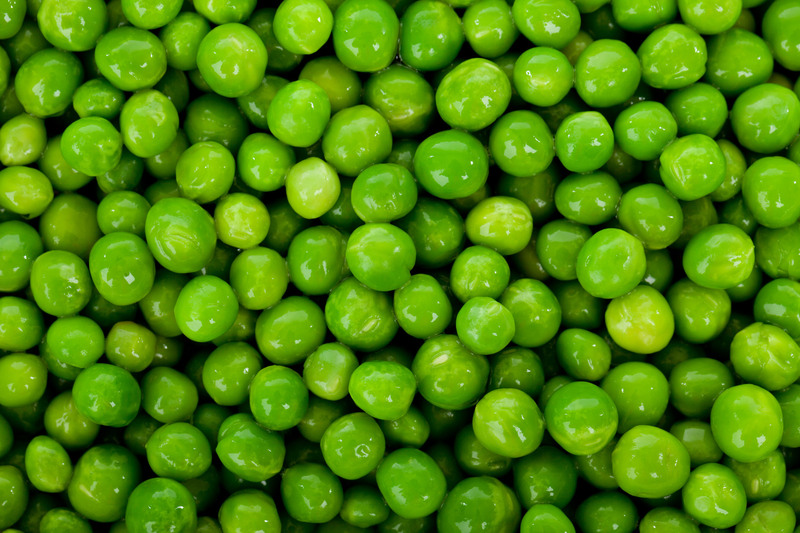 Cook until peas are tender, about 1 to 1¼ hours. Serve with thick slices of rustic bread (if desired). Dried peas, a small but nutritionally mighty member of the legume family, are a very good source of cholesterol-lowering fiber. Not only can dried peas help lower cholesterol, they are also of special benefit in managing blood-sugar disorders since their high fiber content prevents blood sugar levels from rising rapidly after a meal. Fiber is far from all that dried peas have to offer. Dried peas also provide good to excellent amounts of five important minerals, three B-vitamins, and protein—all with virtually no fat. As if this weren’t enough, dried peas also feature isoflavones (notablydaidzein). Isoflavones are phytonutrients that can act like weak estrogens in the body and whose dietary consumption has been linked to a reduced risk of certain health conditions, including breast and prostate cancer. 2. Coat cauliflower in a couple of tbsp of coconut oil and roast for 20-30 minutes or until lightly golden. 3. Heat remaining oil in a large sauce pan over a medium heat. 4. Add garlic and sauté until golden. 5. Add water, roasted cauliflower, herbs and spices. Bring to the boil then simmer, covered, for 10 minutes. 6. Meanwhile heat oil in a pan, add mushrooms and zucchinis and sauté until golden. 7. Remove the cauliflower mix from heat and set aside to cool slightly. 8. Blend until smooth and return to pan, add coconut cream and heat slowly until hot. 9. 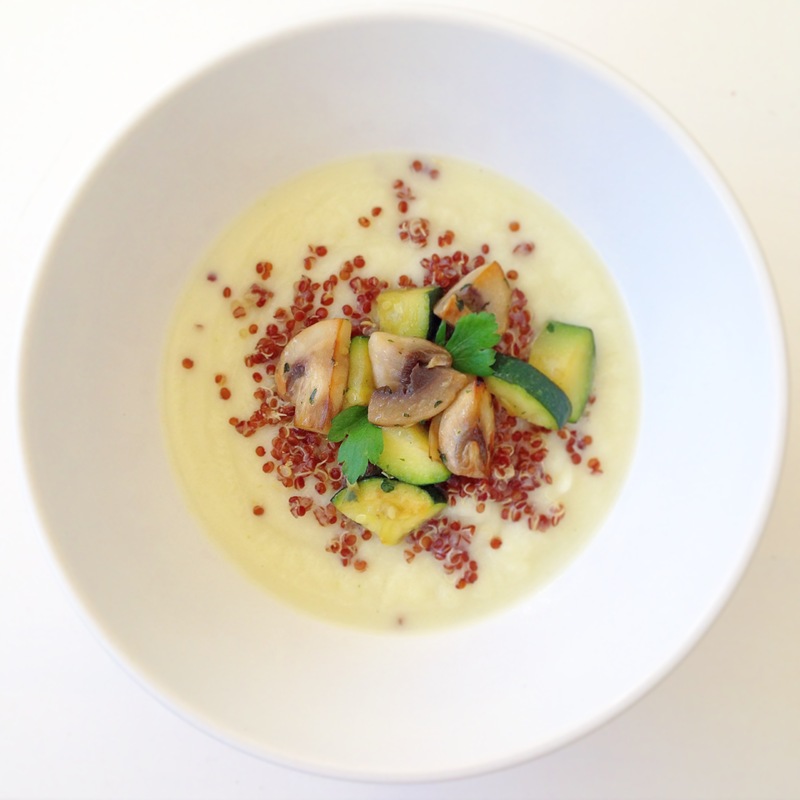 Serve in a bowl with quinoa, mushrooms and zucchinis on top.